Richard Siken is an American poet, painter, and filmmaker. He is the author of the collection Crush (Yale University Press, 2005), which won the Yale Series of Younger Poets Competition in 2004. His second book of poems, War of the Foxes, was released from Copper Canyon Press in 2015. Siken studied at and received a B.A. in psychology and later a Master of Fine Arts in poetry from the University of Arizona. In 2001, Siken co-founded Spork Press, where he continues to work as an editor. 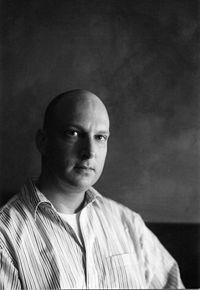 Siken received a Literature Fellowship in Poetry from the National Endowment for the Arts, and his book Crush was awarded the Lambda Literary Award for "Gay Men's Poetry" in 2005, and the Thom Gunn Award from Publishing Triangle. The 1991 death of his boyfriend influenced his writing of the book. Siken's most recent book, War of the Foxes, was published in 2015 by Copper Canyon Press, was a recipient of two residencies with the Lannan Residency Program, and a Lannan Literary Selection. Siken currently lives in Tucson, Arizona. Crush won the 2004 Yale Series of Younger Poets prize, selected by Louise Glück. It was also a finalist for the National Book Critics Circle Award, the Lambda Literary Award, and the Thom Gunn Award. Siken is also the recipient of a Pushcart Prize, two Arizona Commission on the Arts grants, and a fellowship from the National Endowment for the Arts. ^ a b "Richard Siken". Poetry Foundation. Poetry Foundation. ^ "Nerve-Wracked Love by Nell Casey". Poetry Foundation. 2016-11-16. Retrieved 2016-11-16. ^ "Previous Lammy Award Winners". Lambda Literary Foundation. Archived from the original on 2008-05-04. Retrieved 2008-08-06. ^ Schuman, Joan (2006-04-13). "Poetry Personas: Three well-known writers reflect on new, contemporary work". Tucson Weekly. ^ Robinson, Shane. "Lannan Literary Program - Lannan Foundation". www.lannan.org. Retrieved 2016-11-18. ^ "National Book Critics Circle: awards". bookcritics.org. Retrieved 2016-11-18. ^ Cerna, Antonio Gonzalez (2005-04-09). "18th Annual Lambda Literary Awards". Lambda Literary. Archived from the original on 2013-12-11. Retrieved 2016-11-18. ^ "Publishing Triangle". www.publishingtriangle.org. Retrieved 2016-11-18. ^ Diaz, Alex. "Richard Siken - Lannan Foundation". www.lannan.org. Archived from the original on 2016-11-19. Retrieved 2016-11-18. This American poet–related article is a stub. You can help Wikipedia by expanding it. This page was last edited on 17 April 2019, at 16:31 (UTC).